Part One: I’ve been tagged! >It always comes in threes!! Went to dinner at Jeff’s parents’ house. Played Guitar Hero World Tour. Played with Ruthie & Zoe. Go visit my family in Virginia in the near future. Something happening to Ruthie or Zoe. Play some more Guitar Hero World Tour. Pick up the front room. Go to bed at a semi-decent hour. Go have a girls night out with my friend Melinda. >I got tagged by Linda, and I’m finally getting around to answering the questions! Got up out of bed. Sat on the phone for 25 minutes with Toys R Us customer service. Went to Robert’s Arts & Crafts. Putting up our first real family Christmas tree! Finish buying ornaments for said Christmas tree! Getting my new Cricut Machine. Seeing the girls in their matching Halloween costumes. Wrath of the Lich King Expansion release next month! Getting my Christmas shopping and Zoe’s birthday shopping done early! My new cricut to get here safe and sound. Saving up enough money to buy a house. My dad coming out for Thanksgiving or Christmas. My mom & brother coming out for Christmas. My sister moving out here next year. Getting a good deal on a new TV since ours is going out. Paying our car off early next year. Being able to take a trip to Virginia in 2010! And I got a request from my dear cousin Liz to post more pictures of the girls and of us.. and I will since tonight is the Trunk or Treat at Jeff’s parents’ ward! I’m excited to get pictures of the girls in their matching costumes… speaking of which, I need to get ready for that! And I only have Valerie to tag.. so Valerie, you’re it! to do the tag that is.. hehe. >Got tagged by Linda Butler. YAY! Or something. Anyway here it goes. 1. Each player/person starts with 8 random facts/habits about themselves. 2. People that are tagged write a blog about their own 8 random things and post these rules. 3. At the end of of your post don’t forget to tag 8 people and include their names. Don’t forget to leave leave them a comment to tell them they’ve been tagged, and to comment back and read your blog for the whole story. 1. One of my deepest desires is to be in a fantasy movie in a setting not unlike ‘Dungeons and Dragons’ and play either a Bard or Roguish character. 2. I’ve always wanted to write a book; however the subject keeps changing. 3. I dislike people who mooch off of government assistance and then complain about being poor when they are too lazy to work full time jobs. 4. I love popping Jeff’s pimples. 5. I’m obsessive about photo-shopping blemishes and whitening teeth in pictures. I love doing stuff in Photoshop altogether and will look up tutorials on new things when I’m bored. 6. I hope to get my Driver’s License someday. 8. I love sleeping, but I hate going to bed. No one because the people who I have contact with on here have already been tagged. So the cycle or at least my part ends here. Ending internet spam FTW! I -sort of- got bag tagged! Basically what you do is take the contents of your bag -purse, diaper bag what have you- and take a picture of the bag itself, and then you take out the contents and photograph them too! No cheating you can’t throw trash away or anything. Anyway, since I have a small infant I currently do not use my purse. So here’s my diaper bag! 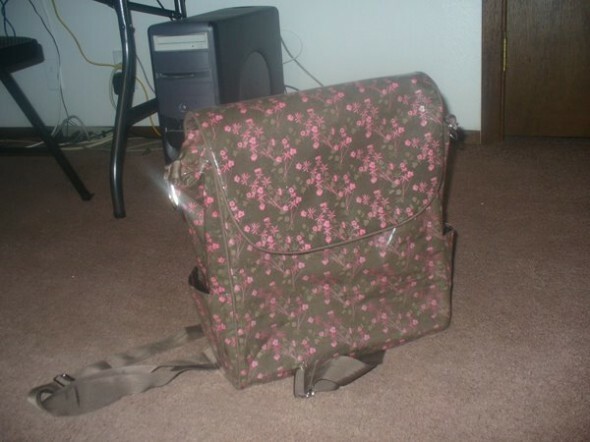 Here’s my diaper bag. It can be worn like a backpack and it’s covered in plastic to protect the fabric. I’m quite fond of it! 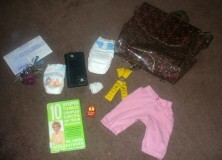 Stuff in my diaper bag! Here’s what was in my bag: vehicle registration for my FIL’s van. Since we’ve used it for fishing last year and currently using it as storage for the rest of the stuff from our old apartment. Then you can see my keys; those are pretty self explanatory. ::wink::. Then you can see two different sized diapers; one’s for Zoe and one’s for Ruthie. Then the black thing is my wallet which has my debit cards and whatnot. I’m a smart consumer and I don’t carry my SSN card with me at all; something that’s not very safe. Then the little cloth ball thing are a pair of Ruthie’s socks, and those are a pair of her pants. Then there’s two tubes of Powdered Formula for when My Mother in Law babysits the girls. Then there’s a tiny box of Raisins. And the last thing is the current Book I’m reading called 10 Stupid Things Couples do to Mess Up Their Relationships by Dr. Laura Schlessinger. There’s my Diaper Bag. So yeah. Enjoy!